0XL---Bust: 43.3inch, Length: 35.0inch, Sleeve: 13.8inch, Shoulder: 12.6inch, Waist: 31.5inch, Hip: 54.3inch. 1XL---Bust: 45.3inch, Length: 35.4inch, Sleeve: 14.2inch, Shoulder: 13.0inch, Waist: 33.5inch, Hip: 56.3inch. 2XL---Bust: 47.2inch, Length: 35.8inch, Sleeve: 14.6inch, Shoulder: 13.4inch, Waist: 35.4inch, Hip: 58.3inch. 3XL---Bust: 49.2inch, Length: 36.2inch, Sleeve: 15.0inch, Shoulder: 13.8inch, Waist: 37.4inch, Hip: 60.2inch. 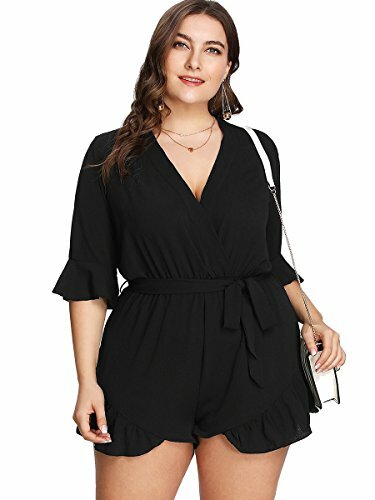 Plus size casual one Piece flower print romper jumpsuit for women. Material: 100% Polyester, fabric has no stretch. Half sleeve, flounce sleeve, deep V neck, tie waist, knot, ruffle hem, floral print. Style: party playsuit, one piece romper, short jumpsuit. Suit for summer party, beach wear.